Garam masala is an amazing spice mix. It is not meant to be cooked with but is stirred in to a curry at the end of cooking or used as a finishing garnish. You can buy a commercially made garam masala if you don’t want to buy all of these whole spices. However, if you happen to have these sitting around the spice cupboard you will be greatly rewarded by making your own. 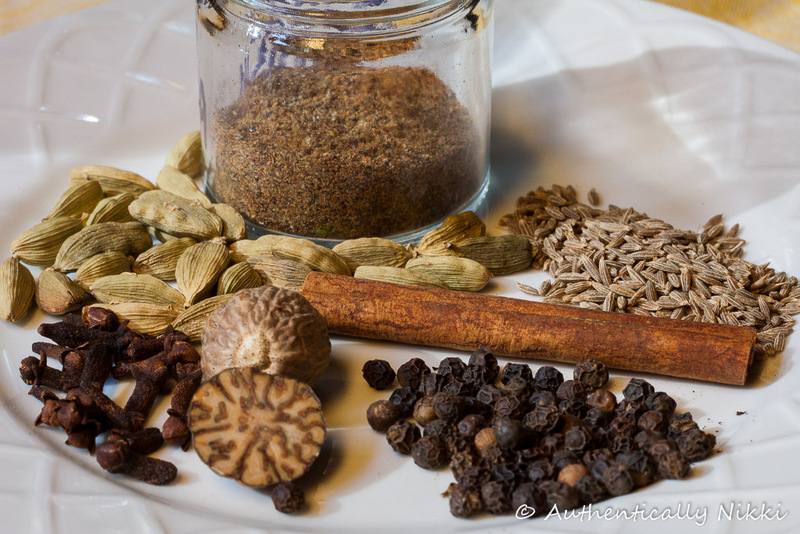 There are so many different ways to make garam masala and every Indian cook has their own combination of these and other spices. What I like about this one is it’s simplicity, not too many flavors competing for attention. The most time consuming part of this is removing all the cardamom seeds from the pods. They do open up easily if you lightly press on them with a meat mallet or the side of a chef’s knife. And this is a great way to use up all of those nutmeg pieces that are just too small to grate on a microplane. Grind all the spices together in a coffee grinder or mortar and pestle. Store in a cool dark cupboard. Makes about 1/4 cup. This entry was posted in Food, Spice Mixes and Rubs and tagged garam masala, Indian, spices by authenticallynikki. Bookmark the permalink.